Holwell Sports let Holbrook off the hook as missed chances came back to haunt them in their midweek trip to Derbyshire. A small band of committed followers joined the team in making the arduous trip last Wednesday evening for a re-arranged match as clubs look to catch up with fixture schedules decimated by one of the worst winters for sport in years. Holwell started well kicking up the long slope, and soon had their first opening when the ball was quickly moved from left to right by Betteridge to Chapman then on to Reek whose good shot was well saved. This set the pattern for most of the first half as the visitors dominated play. Reek again did well to break from midfield and sent a low ball across the box, but there were no takers. Connor O’Grady’s effort at the back post was cleared. Two big chances followed for Cowling and Tinsley, but both attempts were hurried and shanked wide when well-placed. Cowling did well to get to another Betteridge cross on the half-hour, but his attempt was wide of the target. Reek then shot straight at the keeper after more good work on the left. Holbrook finally started to get into the game, and Matthew Harris was presented with a glorious chance, but lobbed the ball over when it looked easier to score. Holbrook let the visitors off the hook again minutes later in a strong finish to the half as Isaac Minnott was guilty of poor finishing when well placed. The second half started with the hosts now facing the slope, but it didn’t seem to bother them as they looked a more competent side after the break. But still Holwell had the better of the early exchanges as Tinsley then Michael Stevenson had big chances to give Holwell the lead. Yet Holbrook looked more up for it and only a last-ditch tackle by captain Ian Bitmead denied Harris the opener. The game hinged on a dramatic two-minute spell as Holbrook went ahead after 65 minutes. The ball was moved across the box when it inadvertently hit referee Constable, and Minott reacted quickest to smash the loose ball past Holwell keeper Jamie Witham, who did well to get to a hand to the ball. And two minutes later, and with their tails up, Minott scored a second, shooting past Witham from the right of the box. The visitors showed character as they tried to get back on terms, but losing the influential Chapman to injury disrupted their play. Tinsley did well on the right and his pinpoint pass left Reek one-on-one with the keeper, but the ball again cleared the bar. Cowling made amends with 11 minutes left as he headed in Betteridge’s cross to give Holwell hope for a draw at least. However, Holbrook were not finished and it took some big defending to deny them a third in the last few minutes as Minott and Sasha Marcelic both let the visitors off the hook after they were presented with good opportunities late on. 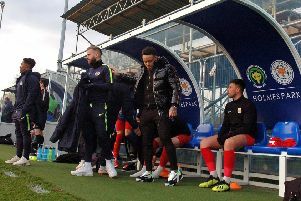 Holwell’s hopes of putting the matter straight over the weekend as both Saturday and Easter Monday matches were washed out. They are due to host Dunkirk on Wednesday night (kick-off 7.45pm) if the pitch dries out, before back-to-back away matches at bottom side Radcliffe Olympic on Saturday (ko 3pm) and Birstall United the following Tuesday (7.45pm). Holwell: Witham, B. Smith, Bitmead, Woodcock, Betteridge, Reek (S. Smith), O’Grady, Stevenson, Chapman (Wright), Tinsley, Cowling.